Believed by the Japanese to be a great protector, Jizo welcomes visitors with his warm presence. 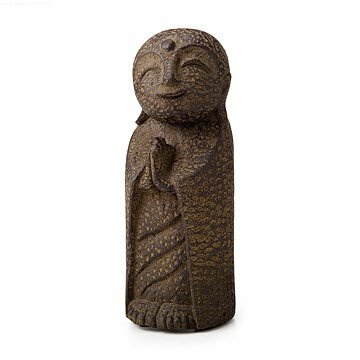 Believed to be a great protector of women, children, and travelers, Jizo looks over your garden with a calming smile and Namaste pose. A soothing way to welcome guests to your home, this peaceful focal point is cast in rich, antique brown volcanic ash and waterproofed for indoor or outdoor use. Made in Indonesia. Agus Kartini grew up looking up to his father, a renown local Stone carver in his remote rural region of Indonesia. He rapidly built his reputation as an efficient and creative carver and now provides stable work opportunity for a substantial portion of his spouse village. 8" H x 3" Dia; 3.4 lbs. Weathered for indoor or outdoor use. I am enjoying sharing my desk space. He makes me smile when I see him. I am very satisfied. So beautiful I purchased another for myself. Was a gift - my friend loved it! It brings a smile to our faces when we see it. Really pleased with smiling jizo! A little smaller than expected (approximately 8") but quite heavy and makes me smile every morning. Perfect for indoor garden, outdoor garden, dining table...anywhere. May need to buy a couple more! It looks just like the picture. Super cute and smiley. It's now sitting watching over the veggies and bringing Mom good luck and positive vibes for her garden! This is a beautiful little sculpture! The recipient of this gift absolutely loved it!